A tiny asteroid looping around Earth for the past seven years is about to leave the neighborhood. June 9, 2006: News flash: Earth has a "second moon." Asteroid 2003 YN107 is looping around our planet once a year. Measuring only 20 meters across, the asteroid is too small to see with the unaided eyeâ€”but it is there. This news, believe it or not, is seven years old. "2003 YN107 arrived in 1999," says Paul Chodas of NASA's Near Earth Object Program at JPL, "and it's been corkscrewing around Earth ever since." Because the asteroid is so small and poses no threat, it has attracted little public attention. But Chodas and other experts have been monitoring it. "It's a very curious object," he says. Most near-Earth asteroids, when they approach Earth, simply fly by. They come and they go, occasionally making news around the date of closest approach. 2003 YN107 is different: It came and it stayed. "We believe 2003 YN107 is one of a whole population of near-Earth asteroids that don't just fly by Earth. They pause and corkscrew in our vicinity for years before moving along." "These asteroids are not truly captured by Earth's gravity," notes Chodas. "But from our point of view, it looks like we have a new moon." Astronomers know of at least four small asteroids that can do this trick: 2003 YN107, 2002 AA29, 2004 GU9 and 2001 GO2. "There may be more," says Chodas. He believes the list will grow as asteroid surveys improve in sky coverage and sensitivity. At the moment, only two coorbitals are actually nearby: 2003 YN107 and 2004 GU9. The others are scattered around Earth's orbit. 2004 GU9 is perhaps the most interesting. It measures about 200 meters across, relatively large. And according to calculations just published in the Monthly Notices of the Royal Astronomical Society (S. Mikkola et al., 2006) it has been looping around Earth for 500 years--and may continue looping for another 500. It's in a remarkably stable "orbit." Right now, however, researchers are paying more attention to 2003 YN107 for one simple reason: it's about to depart. The asteroid's corkscrew path is lopsided and on June 10th it will dip within 3.4 million km of Earth, slightly closer than usual. Earth's gravity will then give the asteroid the nudge it needs to leave. "This is a chance to observe one of these asteroids [on the way out]," explains Chodas. 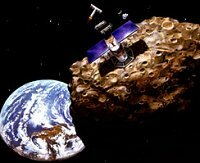 Right: Asteroid mining, an artist's concept. It won't be gone forever. In about 60 years 2003 YN107 will lap Earth again, resuming its role as a temporary, corkscrewing moonlet. In due course, other coorbitals will do the same. Each encounter is an opportunity for study--and possibly profit. Even the most powerful telescopes cannot see much of these tiny asteroids; they're just specks in the eyepiece. But one day, when the space program is more advanced (see the Vision for Space Exploration), it might be possible to visit, explore the moonlets and tap their resources. "For now, they're just a curiosity," says Chodas. News flash: Earth is about to lose a moon. More to come. Asteroid 3753 Cruithne is often mentioned as an Earth Coorbital Asteroid, but Paul Chodas feels it does not fit in this category: "Its orbit is too eccentric (e = 0.51)," he explains, so it does not perform the same corkscrew motion characteristic of the others. Where do coorbitals come from? "Some of them may be boulders blasted off the Moon--the real Moon--by meteorite impacts. Others probably came here from the asteroid belt," says Chodas. None, he emphasizes, are big enough to do widespread damage if they actually hit Earth. Hot off the press: This month's issue of the Monthly Notices of the Royal Astronomical Society contains a paper about coorbital asteroids: "Stability Limits for the Quasi-satellite Orbit," by S. Mikkola et al., MNRAS, 369, 15-24 (2006). 3D orbits: 2003 YN107 and 2004 GU9.